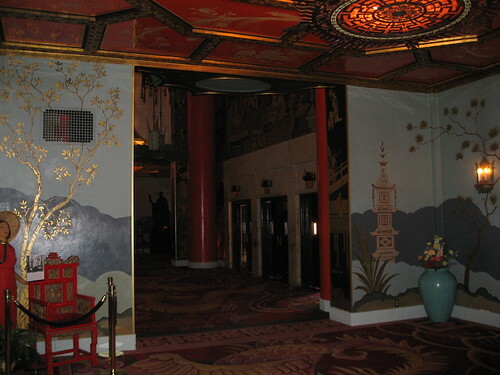 In any event, I thought it would be a hoot to visit Grauman’s at three different times of the day – early morning, mid-afternoon, and evening. Which is funny, really, because I hate going to Hollywood Boulevard as most of you do. 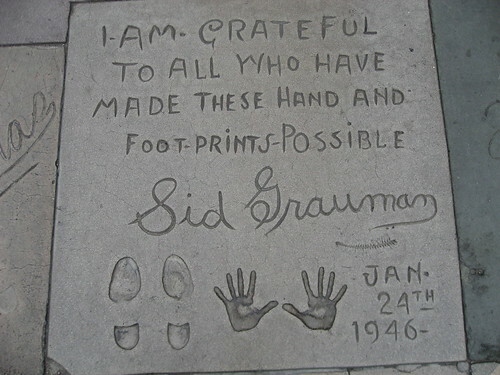 Sid Grauman, “Hollywood’s Master Showman”, already had downtown Los Angeles’s Million Dollar Theatre and the Egyptian Theatre (HCM No. 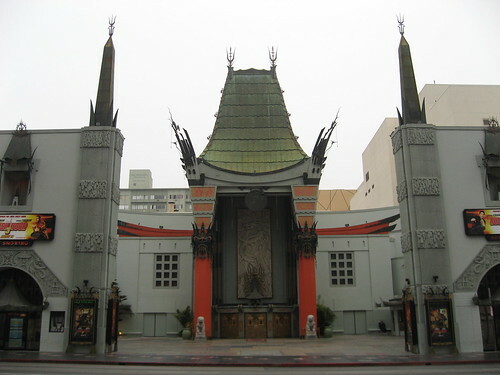 584) in Hollywood when he opened the Chinese Theatre. 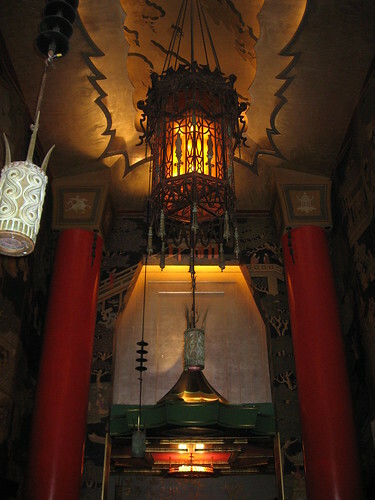 His partners included Mary Pickford and husband Douglas Fairbanks (Fairbanks was Pickford’s husband, not Grauman’s – ed.). 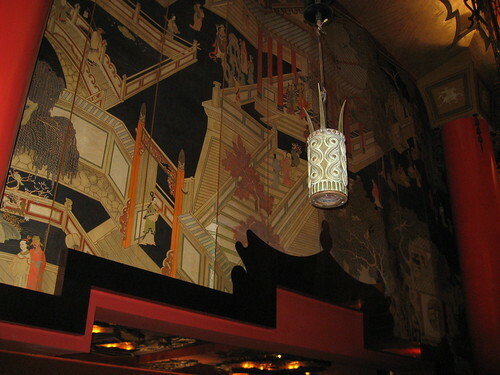 While the architectural firm of record is Meyer & Holler, Raymond M. Kennedy is credited with the brunt of the design work of the pagodaesque building. It was built on the site of the former home of Francis X. Bushman. 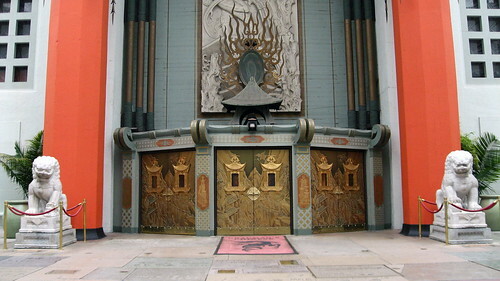 The theatre opened May 18, 1927, with the premiere of King of Kings from Cecil B. DeMille, whose own footprint ceremony was on 8/7/41. 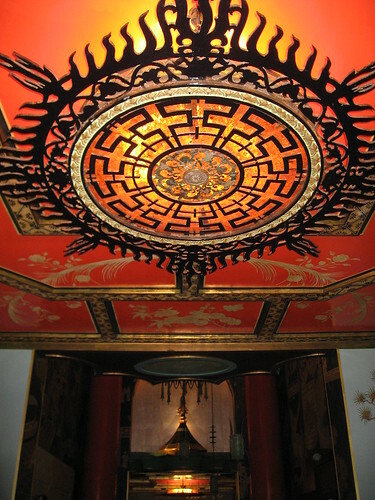 Chinese Heaven Dogs, Ming Dynasty 1403 – 1643. 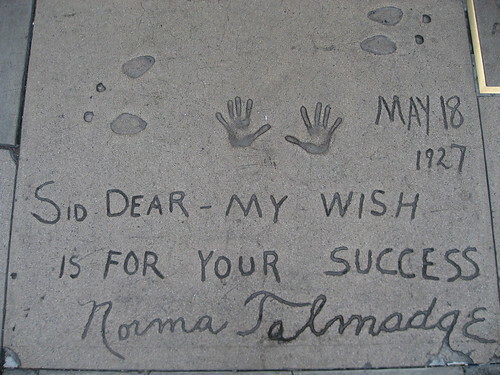 When it comes to the “Forecourt of Stars”, the story pitched by the theatre goes Norma Talmadge was visiting the construction site when she accidentally stepped in wet cement. Smelling a publicity bonanza, Grauman invited his partners, Doug and Mary, back a few days later on April 30, 1927, to officially sink their paws into the forecourt. (Norma returned for her imprinting on opening day.) The first part of this sounds like a lot of p.r. bunk, if you ask me. 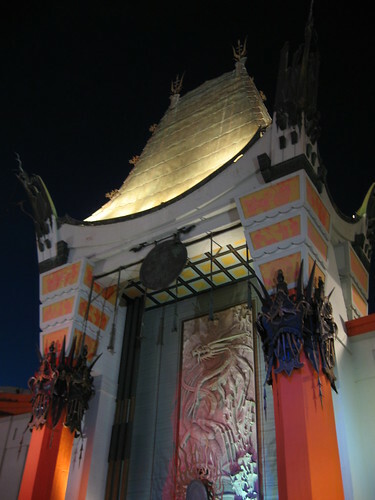 Whatever the genesis, over the years, stars have put their hands, feet, noses, guns, cigars, wands, and whatever else into the ground at this landmark. Here's a list and map of who's there and where. James Stewart was immortalized on Friday the 13th, in February of 1948 (see top). 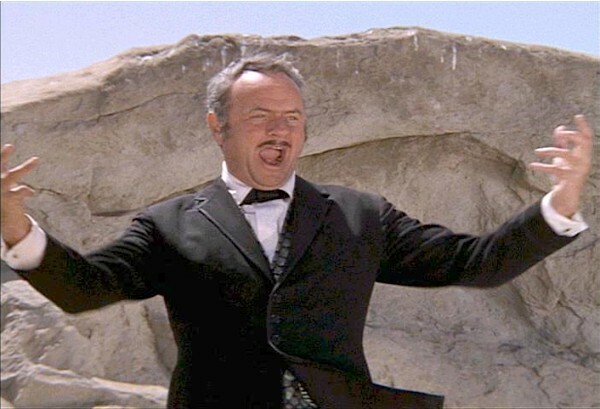 Now, I’m not superstitious, but, less than fifty years later, Jimmy died of “cardiac arrest”. Coincidence? 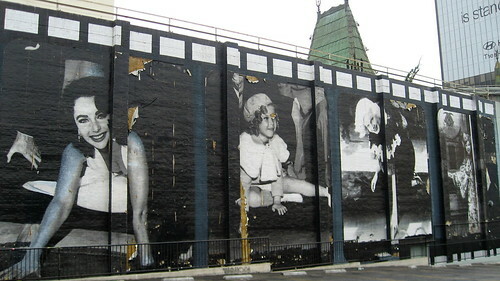 The most popular square is Marilyn Monroe’s (6/26/53). Her i's dot is a rhinestone ring, but the ring part was chiseled out within a few days of her ceremony. Here’s her contribution with co-star Jane Russell’s. Wait. 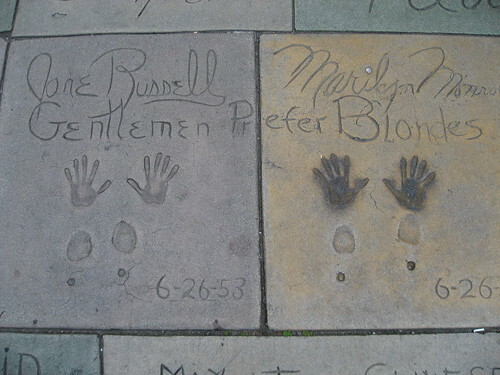 Did I say Marilyn’s handprints were the most popular? What I meant to say was the most popular square is that of movies execs Terry Semel and Bob Daly (not pictured). You should’ve seen the tourists lined up to see if they could literally fill the shoes of Terry and Bob (9/30/99)! Not really. 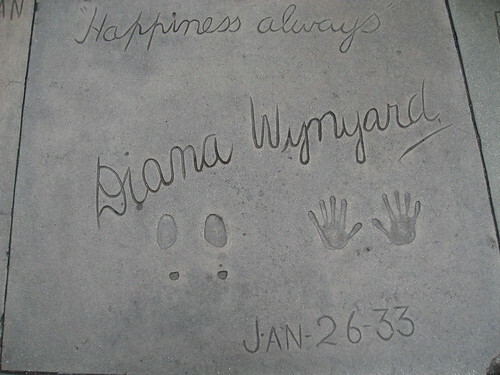 While snapping away, I reckoned the winner of the Most Obscure Footprints Award was Diana Wynyard (1/26/33). 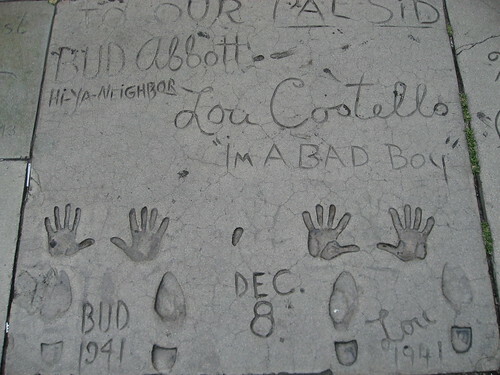 That is until I got back to the BOL headquarters and read Lauritz Melchior’s (11/17/47) handprints are also there. As well as Edmund Purdom’s (8/30/54), Elmer C. Rhoden’s (9/16/58), and Bill Hertz’s (3/18/99). Oh, and contest-winner Charles Nelson’s (4/24/49). Now I don’t know what to think. 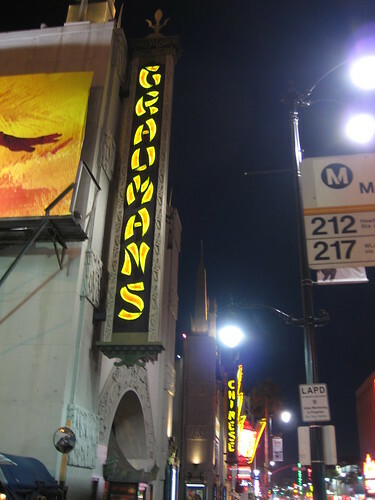 Grauman (1/24/46) sold his share to Fox in 1931, but stuck around as managing director. 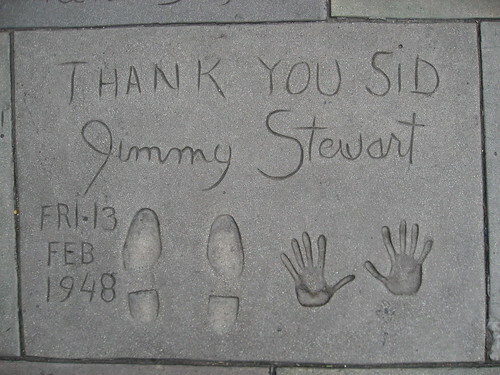 Sid died in 1950. 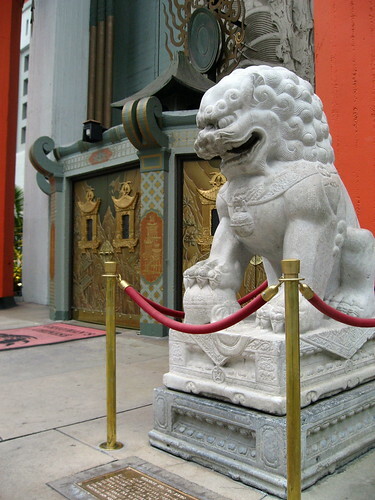 The Chinese was the fourth home of the Academy Awards ceremony (the first, the Roosevelt Hotel, stands cattycorner to Grauman’s). Bob Hope (2/5/43) hosted the Oscars (or, as they were known in his house, Passover) there in 1944, ’45, and ’46. And, now, for the mid-afternoon shots. 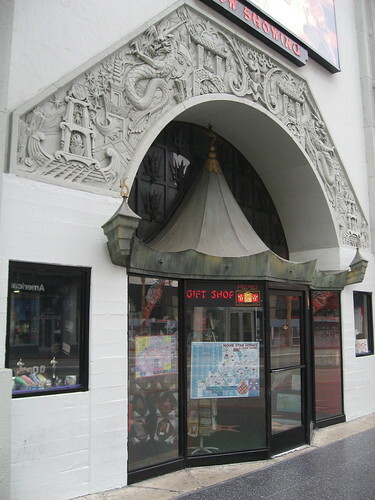 If you go inside, you’ll experience a vintage movie-going lobby, including seeing a wax figure (one of the original three) that actors will touch for good luck when entering the auditorium on premiere nights. Interior murals are by Number One Son, Key Luke. No fooling, Pop. 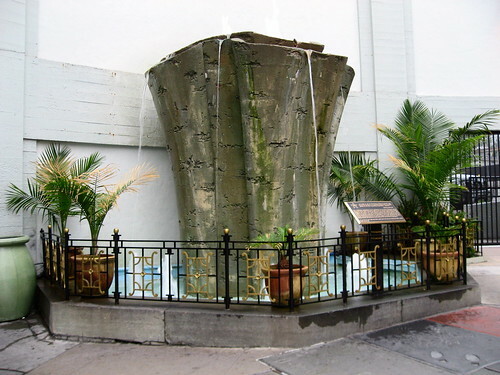 A later addition to the theatre, this candy-stand became famous when Hedley Lamarr bought his Raisenetes here in 1974. 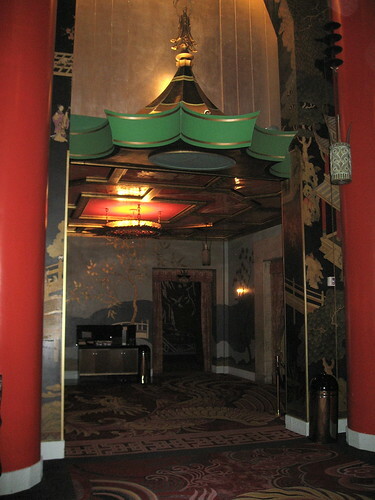 The Mann Theatre chain bought the Chinese in 1973, re-naming it Mann’s Chinese Theatre. 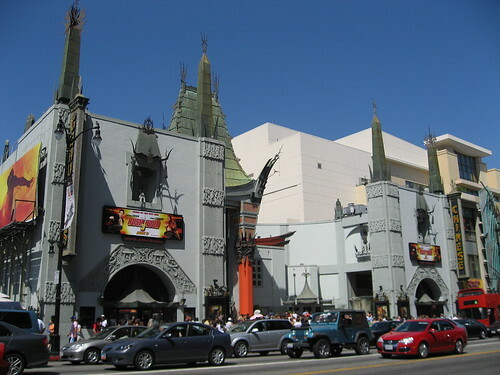 WF Cinema Holdings (WF Cinema Holdings = Warner Bros + Paramount Studios) now owns the theatre and has switched the name back to Grauman’s. (An adjacent multi-plex still bears the Mann moniker.) 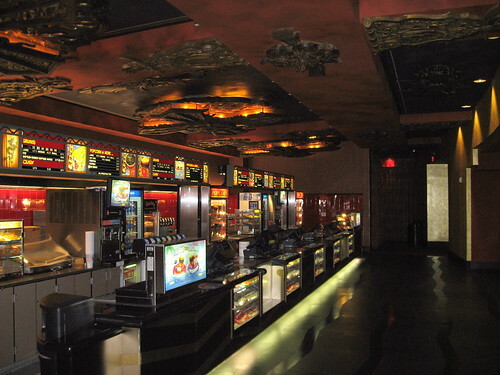 The Chinese received a major renovation to coincide with the opening of the nearby Hollywood Highland Center on, er, Hollywood and Highland. 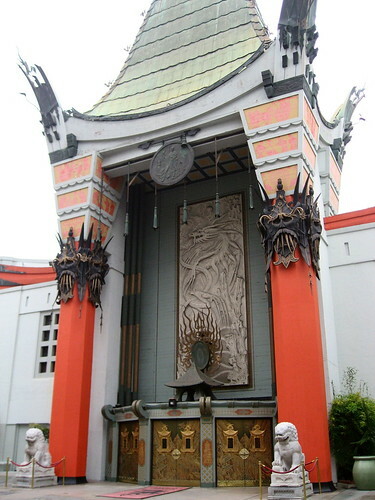 In reference to SID GRAUMAN's CONCRETE BLOCK SIGNED at the forecourt of the Chinese Theater, one of the people he was refering to was someone who was been lost in hollywood history of records but surely not forgotten. Our family would like everyone to recognize John Tartaglia, serving after Jean Klossner, as one of the other "cement artists" and assistants to Sid Grauman. 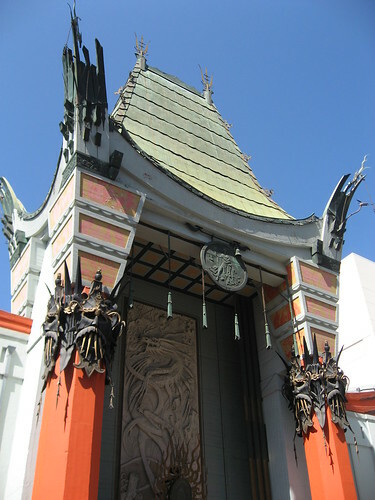 You will find his Photos in the book published and entitled: Hollywood's Chinese Theatre: The Hand and Footprints of the Stars (The publisher FAILED, however, to include John Tartaglia's name next to his own photo). It is quite a shame. Someone should own up to offering an apology for a loss of recognition of such important times in history. Please visit FACEBOOK.COM where you will find a photo and article of my great uncle, John Tartaglia. Kindly add his name to this website so that he may receive therecognition earned for his work and part in making Hollywood history. Please do so in honor of him and his surviving family. Records were somehow lost or forgotten and books that were recently published regarding the footprint ceremonies FAILED to include his name, even though they included his photos in the book. P.S. Please contact me via my website if you have any questions. I am trying to resolve this matter while his son, My Godfather, is still alive with us.